Recently, news broke in a local Chinese newspaper about the death of a young lady supposedly because of Botox injections. This was quickly picked up by many other newsmakers and created a state of panic amongst my patients and friends. I received various questions: “Can botox kill? Is this true? Isn’t that a terrible price to pay for such a young lady with a bright future?” Even Straits Times and The New Paper reached me for a comment regarding the case. While I am sure the family appreciates the outpouring of concern and mourning, it is important to get the facts right even when mourning. Getting things wrong could potentially make it worse for all parties involved, including the unfortunate family members. I analyse in this article what the facts of this case are, and how dangerous Botox can be exactly. Unverified news over-sensationalized by newsmakers. 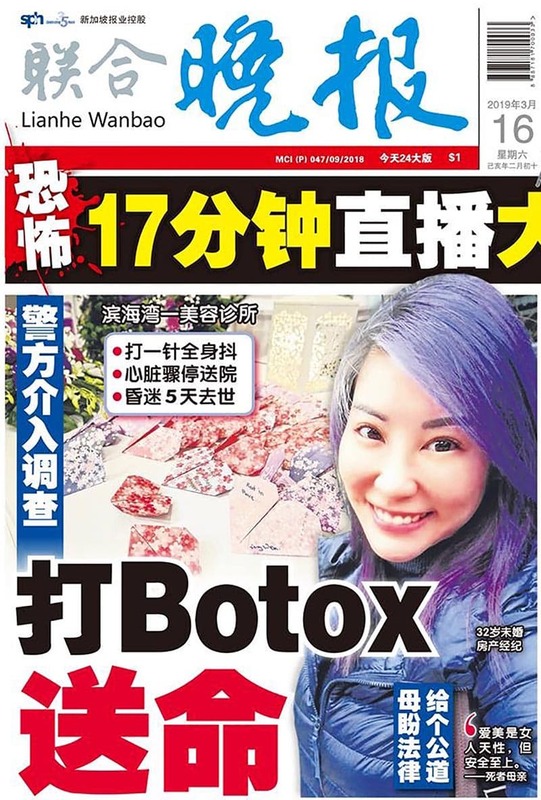 Lianhe Wanbao grabbed the headlines claiming that Botox treatment was the cause of death. The article itself mentioned that they were UNSURE if Botox was injected at all. Even other newsmakers like Mothership used a catchy title that flashes: “allegedly died after Botox injection” to grab more eyeballs but subsequently wrote that “the medication that was used in the injection has not yet been identified”. Does no justice for the deceased and her family, as it can confuse them further in this difficult time, not to mention attract a lot of unwanted attention. It also confuses the public and causes panic in those currently undergoing botox treatments or planning for them. 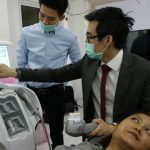 There have been so many false rumours spreading since the incident: even talk that illegal whitening injections or sedation without anaesthesia being performed. All these are currently unconfirmed speculation. Lastly, it hurts the caregivers and the healthcare team involved in the incident. Most doctors try to do their best to help their patients; as one myself, I only want the best treatments for my patients. It would it extremely hurtful to be accused of causing the death of a patient when he/she might not be directly responsible for. The patient became unconscious in an aesthetic clinic. Whether any treatment was administered yet is not confirmed. Doctor and team tried to resuscitate her and call was made for emergency services promptly. The doctor accompanied the patient to a hospital where they continued to resuscitate her. She was on life support for days, before finally giving in and passed away. There is a coroner’s inquiry ongoing for the case and the facts of what is actually the cause of death are still pending investigation. Isn’t botox also called botulinum toxin? So is it toxic and can it kill? Review papers done on the side effects of Botox injections show that death after Botox administration for cosmetic indications had never been documented with standard approved formulations (1). The only reported death (in the world) from proper medical Botox use was due to a severe allergic reaction, which could have been from a numbing agent that was administered as well. 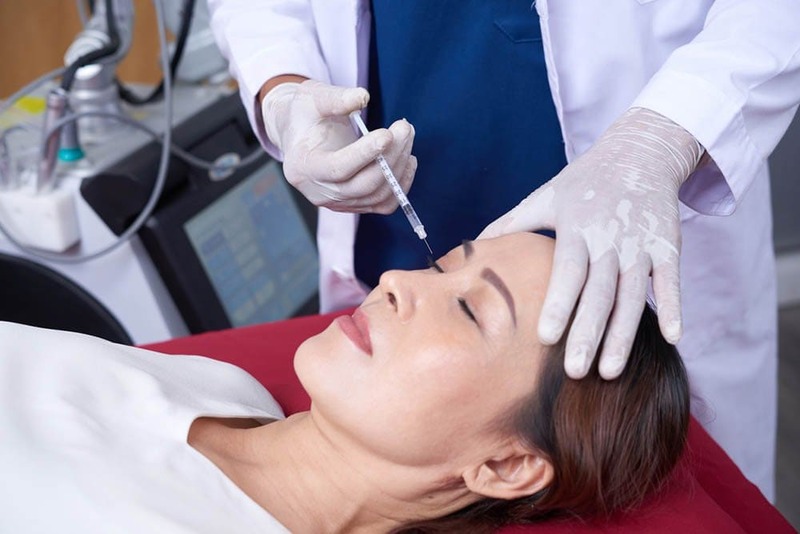 Hence, botox could not be identified as the definite cause of death, but only that it was possibly Botox or the Lidocaine that was used in the mixture. Moreover, the dose of Botox, in that case, was much greater than the approved cosmetic dose (2). Severe allergic reactions to lidocaine (numbing agents) are far more common than with Botox. This means it would take at least 123 vials of 100U Botox injected to kill somebody when cosmetic indications rarely use more than 1 full vial per visit! The patient was at a licensed clinic which would mean it was likely to be using properly licensed products. There were reports from the death of individuals from improper botox use, which found that those individuals were injected with 2857 times the human lethal dose. This was done at an unlicensed centre with an unlicensed product. Paracelsus 1493 – 1541 (AKA the father of toxicology) said: “All things are poisons and there is nothing that is harmless, the dose alone decides that something is no poison” Hearing that Botox is poisonous should not alarm you that much when you understand that properly licensed products used appropriately will never reach lethal doses! Authorities had found unauthorised dangerous drugs at the clinic of the veteran plastic surgeon. In other words, Botox was again not found to be the cause of death (not yet at least). Since the news of this case broke, many rumours have been spreading speculating the possible different causes of death, with some even suggesting patient and doctor partaking in illegal treatments that could have caused death. Isn’t that too presumptuous if the facts of the case are still under investigation? I do not know the doctor very well, but I have heard from many esteemed colleagues that the doctor involved in this case is a conscientious and hardworking doctor. I can only imagine how hurtful it would be if he had been discharging his duties in a responsible manner. It would really be fairer to wait for the official investigation and truth, rather than smear his name only to clear it up later. So what are the possible side effects? That being said, a medical or cosmetic dose of Botox is not without risks. I explain these risks to patients before the procedure and most people are initially shocked that risks can happen from such a commonly done injection. After some explanation, they quickly realise it is normal for every procedure to have risks, and that we only proceed if the cost, benefit and risk ratios are worthwhile. As I like to say, even crossing a road with the traffic light green comes with risks – errant drivers are something you cannot control! Hence while it is important to watch out for the risks, it should not prevent you from crossing that road if the benefits far outweigh the risks. All of the above described side effects are temporary and short lasting, but Botox can actually have permanent effects if used indiscriminately and repeatedly. Patients and even doctors may not realise the damage because these effects are mild and happen over the long run. Chronic and semi-permanent muscle atrophy is real and I frequently see new patients who have that. Muscle atrophy also causes bone changes and Botox was also shown to cause that (4). Lesson learnt: don’t try to decide for yourself if you “need” botox. Find a doctor you can trust and listen to his opinion. Some patients tell me that they tell their doctors where they want botox and even how much they require, and the doctor helps them with exactly what they want. Wouldn’t it make more sense if the doctor with years of experience advises you on which areas you need them, and what dose!? If you stop seeing results from your Botox treatments, stop doing them already. The short and long term risks are not worth it, and your money and time are better spent elsewhere. It is always sad when someone dies. My heart goes out to the deceased and her close ones. Indeed, the price tag of beauty cannot be death. The magnitude of this tragedy to her close ones can be the most painful thing that one experiences in their lives, and we all need to practise empathy and responsibility to all parties in reporting such news because false and sensational reporting can have dire consequences when such strong emotions are allowed to propagate in wrong directions. 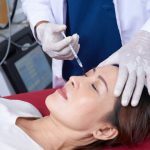 While Botox treatments could come with many possible short terms and even long term side effects, it is an unlikely cause of her demise, and only the investigation can shed more light on the situation. Before that, let’s not panic over the most established aesthetic treatment in the world, and practise some respect all parties involved. Omprakash HM and Rajendran SC. Botulinum Toxin Deaths: What is the Fact? J Cutan Aesthet Surg. 2008 Jul-Dec; 1(2): 95–97. Li M Goldberger BA Hopkins C. Fatal case of BOTOX®-related anaphylaxis? J Forensic Sci. 2004;50(1):169–172. Hwa-Jin Lee et al. Repeated injections of botulinum toxin into the masseter muscle induce bony changes in human adults: A longitudinal study. Korean J Orthod. 2017 Jul; 47(4): 222–228.